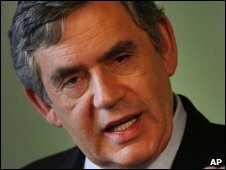 Mr Brown urged a "just distribution of risks and rewards"
British Prime Minister Gordon Brown certainly caused a stir at the G20 finance ministers meeting in St Andrews when he suggested a tax on financial transactions, sometimes called a Tobin tax after the Nobel Prize winning economist James Tobin. The response ranged from massive enthusiasm from some campaigners to near rejection from at least one finance minister. So just what was he suggesting? Actually a number of options, intended to achieve the same underlying objective. To ensure that the financial sector, rather than the taxpayer, pays the cost of future crises. That broad aim has already received some support from the G20 at the leaders' summit in Pittsburgh in September. They commissioned the International Monetary Fund to do some work on and report back when the leaders next meet in Canada in June. When Mr Brown raised this in St Andrews it was the financial transactions tax that really caught the eye. Many development campaigners, groups such as Oxfam and Actionaid, have been seeking such a tax for years. They want the funds raised to be used for aid, and an increasingly popular idea is to use the money specifically to help developing countries respond to climate change - to curb their own greenhouse emissions and to adapt to the warming that is likely to take place. But that is not what the G20 have in mind. The debate that Mr Brown was addressing was about financial crises. He did not go into any great detail, but the money would presumably be saved in some way and used to clean up after future crises. There has been some support for the idea from governments, particularly France and Germany. But the transactions tax faces an uphill struggle. Canadian Finance Minister Jim Flaherty said it was worth discussion but it "would not be a preferred option from the Canadian point of view". US Treasury Secretary Tim Geithner was asked about the tax and insisted on showing what he called "due deference to his host" in Scotland. So, he didn't dismiss the idea outright but nor did he offer even a hint of support. IMF chief Dominique Strauss-Kahn wasn't very keen either. He said it was "a very old idea that is not really possible today". He added that the financial industry was so innovative that it was too easy to avoid a transaction tax. Mr Strauss-Kahn is not against the idea of some sort of tax to discourage excessive risk-taking and to act as an insurance fund to deal with crises. It's just that he thinks financial transactions aren't the best way of doing it. So, Mr Brown has reignited a debate. But he will struggle to make much headway on the financial transactions tax. He insisted Britain would not move alone. All major financial centres would need to be involved, he said. So the lack of American enthusiasm is a very important obstacle. There are, however, other ways of raising money from the financial sector and G20 will get to grips with the IMF's ideas on how next year.